Cave Paper is known for making strong durable and beautiful flax papers. The rugged elegance of the heavyweight sheets is perfect for book covers. We will make 2 books, suitable for sketching, drawing, watercolor etc. The first is a small accordion-fold book that can slip into your pocket for easy sketching -on -the -go. A simple wraparound cover and tie, finish it off nicely. 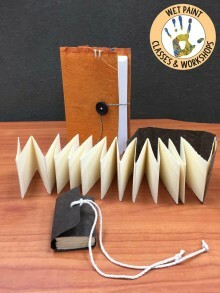 The second is a sewn, codex-style binding utilizing both watercolor papers and drawing papers in the text block, and covered with a heavyweight handmade paper, with a button and tie closure. Bridget O’Malley is a master papermaker and co-­owner of Cave Paper Inc., a handmade paper mill specializing in natural ­dyed flax papers. She is an adjunct professor at the Minneapolis College of Art and Design. She offers book, paper, and print workshops around the country. 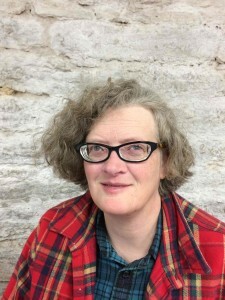 She studied paper making with MacArthur Fellow, Timothy Barrett at the University of Iowa Center for the Book Research and Production Paper Facilities. While there she completed a five ­year papermaking apprenticeship. She also received her MA and MFA in printmaking from the University of Iowa. Her artwork focuses on forms found in nature, and bringing those to life through the interplay of print, paper, and sculpture. She received a Jerome Foundation Emerging Artist grant in 1998, and more recently she was awarded the 2012 Minnesota Book Artist Award.